Guide by Pascal Krumme, originally posted on instructables. This Instructable is associated with my Retro Music Streaming Box. I will show in detail how to set up a Raspberry Pi 2B or 3 to work as a headless Spotify Connect client. It is also possible to install a trial version of the exagear environment. This requires additional tools and I could not test what happens when upgrading to a full license. At first you have to buy the Exagear License using the link from the intro. Make shure to select the right version for your RPI. It is really important to install the Ubuntu 1404lts guest system as it is the only one which is works with Spotify. The installation may take a while. In the next step we will install Spotify in the Exagear environment. Now that you have successfully installed Exagear. Next thing is to install Spotify in the Exagear guest system. As you may have noticed, there is no display attached to the Pi so there is no possibility to access the Spotify GUI. To circumvent this, we install a virtual framebuffer and make it available over vnc. Configuring will be done later… Now install Spotify. Thats it, in the next step we will set everything up an try to start Spotify. Now it is time to setup the VNC server which we want to run Spotify on. echo "Starting vncserver for $USER"
Hit CTRL-X y to save and exit. You will then be prompted to enter your user password (raspberry in most cases) and to create a password to access the vnc server. Now you can try to connect to the VNC server using a VNC client (for example UltraVNC). By default, the VNC server we have just installed runs on port 5901. If you see this in your VNC Client, most of the hard work is done. 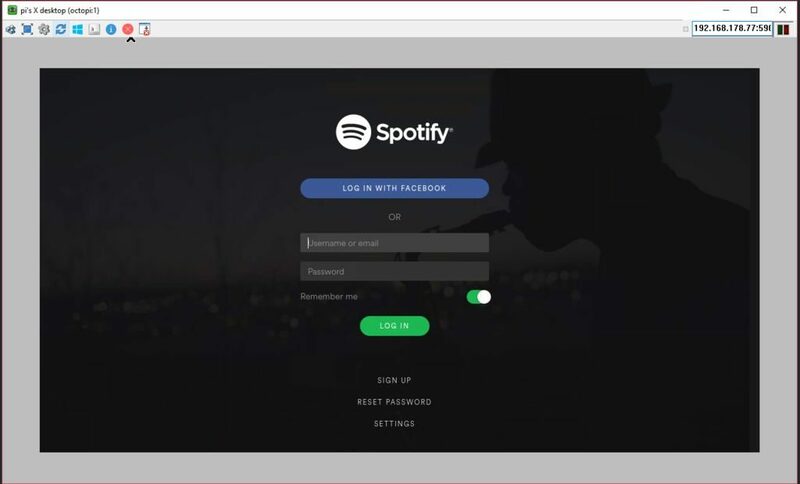 Enter your Spotify account and click login. If you successfully logged in, switch back to you ssh session and kill the program using CTRL-C.
Next step is to set everything up to start directly on boot. This basically consists of two additional script files in different directorys of the host and the guest system. As we did all previous steps in the Exagear guest system we start with the start script here. To return to the host system. Now that we have created a script inside the guest system in a directory which is accessible form the host system we can write a script that executes it on startup of the raspberry. start) echo "Setting Volume, Starting Spotify"
stop) echo "Stopping script blah"
That´s it. 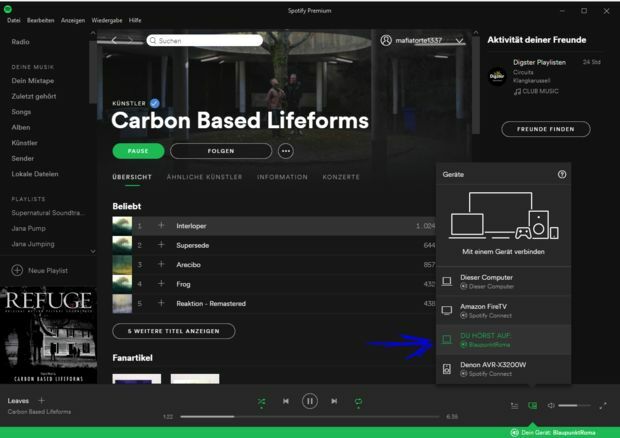 You should now be able to use your Raspberry Pi to Stream music via Spotify Connect. Even the volume control works perfectly.To change the device name in the Spotify connect dialog, simply change the hostname with the raspi-config utility.